He came early in the morning on Saint Patrick's Day 2015 and knocked over my hive boxes in search of his favorite foods—honey and bees. The 400-600 pound male bear had been making the rounds through the town of Poolesville and surrounding farms, finding fodder in bird feeders and tasty dogfood in open garages, until he happened by my gardens and apiary just outside Poolesville in the Agricultural Reserve. We’d just had a late snowfall with about a foot of snow over the region. I have an electric fence that protects the garden and the beehives from the many critters around here, such as the skunks that like to eat bees in winter by scratching on the hive boxes. When digging out I’d turned off the snow-covered electric fence since the snow renders the fence ineffective. But the weather moderated quickly that week, as it does in early March, and the snow melted away. By the 17th the temperatures hovered around 70. I started keeping bees in early 2003, when I moved to the Ag Reserve and planted the first fruit and nut trees in our orchard. Over the years the orchard has been inconsistent in produce, but the bees have always delivered sweet, sweet honey. Initially for our personal use, then as presents for Christmas, extracting honey from the hives became a honey-selling business that is growing today. Local, raw honey is amazingly desirable and precious and it’s in great demand from folks around the area. Having and keeping bees requires many skills. Attention to the weather is one of the most important, as it was that warm day in March. When I got to the garden to inspect the hives, with plans on making splits and nukes to expand my little beekeeping business, I first went to turn off the electric fence. Realizing I had done so a week earlier, I proceeded to have a look at the hives to see if the bees were active. At first glance, it was hard for me to understand what I was seeing. Four of the five hives were knocked over onto the wet ground, with frames of honey and frames of brood spread about. Clouds of bees were everywhere, flying about in confusion. My first thought was: WHO could have done such a thing? Quickly suiting up in my protective gear, for the bees were quite angry, I went to have a look at the mess. That’s when I saw the footprints—large paws with claws marks in the mud. Then muddy prints on the hive boxes and scraped frames. It wasn't any person who had done this, it was a bear, a big one as we later found. This bear had come searching for honey and the delicious protein in the brood frames which are filled with honeybee larvae. I ended up losing one hive and about twenty pounds of honey. Black bears and other scarce wildlife have been reclaiming territory once lost here in Maryland, and the Agricultural Reserve is a welcoming environment. I spent the rest of the day reassembling the hives, adding a frame or two of honey I had stored earlier in the fall. I quickly built an inner fence around the hives, which made me feel better. And yes, I turned the electric fence back on. The Maryland Department of Natural Resources was very helpful in advising me and the community on how to live with bears. We need to know, because they’re simply coming back to lands where they once roamed. 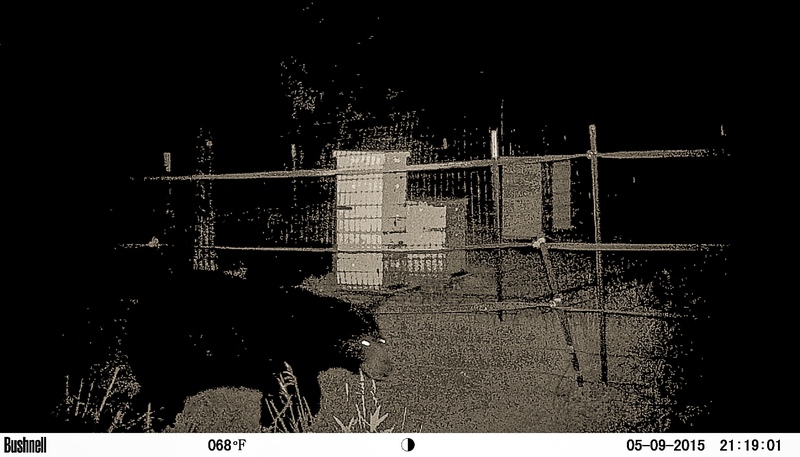 So, I upgraded my fencing, installed a wildlife camera, and even educated the bear on what electricity feels like by baiting the fence with peanut butter-covered bacon. The fellow did return several times that season. He came up to the house and crushed the trashcan holding the broken hive frames, and on another occasion, he bit a finch feeder in two. The "Poolesville Bear," as he’s known, never got back into the apiary, but I got some nice pictures of him walking along the fenceline. Whether the Poolesville Bear is still in the area, I don't know, but there are reports of bears near Sugerloaf Mountain and nearby regions. And so, as the DNR reports, we expect to see more black bears in the future—and we’re prepared.